Having secretly dated for 13 years, Jerry Yan (言承旭) and Chiling Lin (林志玲) allegedly separated sometime between 2009 and 2010. Their relationship was not without its rocky roads, and when both Jerry and Chiling said they were open for a reconciliation last year, fans cheered. According to the Taiwanese media, many fans have already begun speculating that the two ex-lovers have reconciled. The speculation came after the broadcast of a recent episode of the Chinese reality show Sisters Over Flowers 2 <花樣姐姐2>, which included a segment of Chiling trying to pack her luggage for an overseas trip. The room she shot in looked very similar to the room in a photo of Jerry’s nephew, which he allegedly shared on social media a few years back. 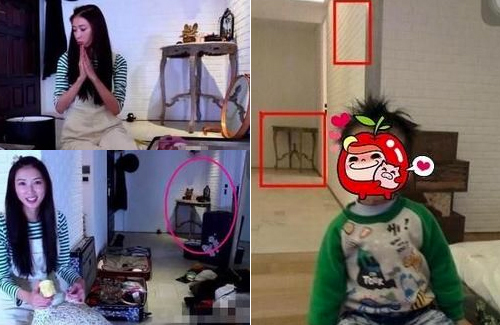 Fans noticed that the side table in the far corner of Chiling’s room is the same table that was seen in Jerry’s old photo. Both rooms have the same white brick designs on the wall and the same white floorboard. The similarities are uncanny. Jerry is the only F4 member who remains to be single. Vanness Wu (吳建豪) married Arissa Cheo (石貞善) in 2013, Vic Chou (周渝民) married Reen Yu (喻虹淵) in 2015, and Ken Chu (朱孝天) has announced that he plans to register his marriage with Chinese actress, Han Wenwen (韓雯雯), soon. Chiling has not responded to the rumors.